Caldo Verde, or Kale soup, is a traditional Portuguese soup dish with Kale as one of its main ingredients and when travelling around the countryside, you’ll see plenty of this vegetable being grown. In Portugal, it’s common to see Portuguese diners having Caldo Verde as a starter. The Portuguese are a nation of ‘soup-eaters’ and this hot vegetable soup is served regardless of the weather and season in the year. Being a soup-eater myself, I like this tradition. It seems that only the residents of Lisbon don’t follow this soup tradition and in summer they have salads instead. This has earned them the nickname of ‘lettuce-eaters’. Our tour director, a gourmand who himself enjoys cooking, says that Caldo Verde is a pretty simple soup to prepare and he rattles off this Caldo Verde recipe. In a large pot, heat the oil over medium-high heat. Add the onions and cook until translucent. Add the garlic and sautee for a couple of minutes, then add the diced potatoes and stock and bring the mixture to a boil until the potatoes are cooked. When the soup is cool enough to handle, puree it in the food blender and return to the pot. Add the greens, bring everything back to a boil and simmer for 2 minutes. Season with salt and pepper, ladle into bowls and garnish with cubes or slices of chorizo. Serve the Caldo Verde soup with bread. 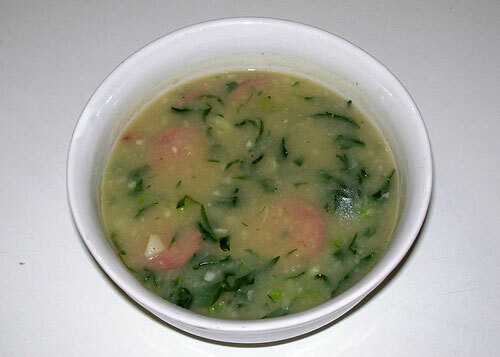 The Portuguese Kale soup may not be fine cuisine, however it is a simple and nutritious Portuguese recipe that almost anyone can prepare at home. Of course there are many variations and different touches that you can add to the Kale soup preparation, however the above is quick and easy recipe from a man who is frequently on the move.